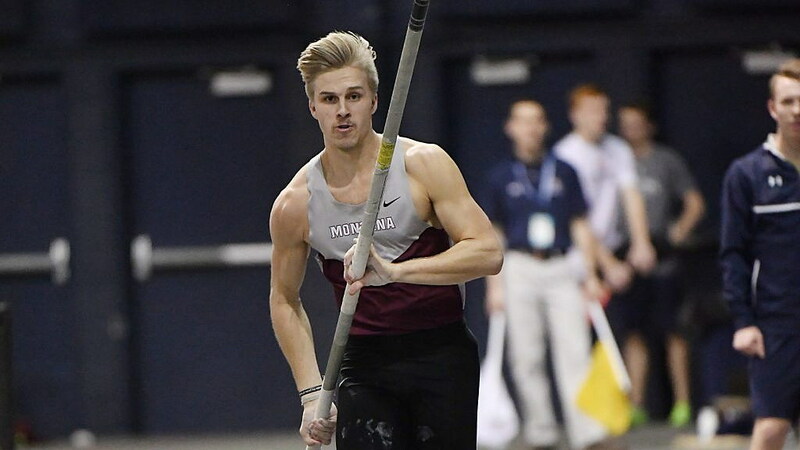 The Montana track and field teams went 6-2 in their duals on Friday against Idaho, Eastern Washington, Portland State and Gonzaga at the Idaho Duals in Moscow. Even shorthanded, the women’s team had five event victories and was a perfect 4-0 in its head-to-head duals. The men’s team had two event wins, with dual victories over Portland State and Gonzaga. The meet came three weeks before the Big Sky Conference indoor championships at Pocatello, Idaho. The women’s team had a strong showing in the middle distance and distance races, and the Grizzlies swept the throws behind Samantha Hodgsonand Hana Feilzer. In the women’s 800, Carly Smiedala and Emily Cheroske finished first and second with times of 2:13.68 and 2:13.79. For Smiedala, a freshman, it was a season best. Along with Megan Franz‘s time from Seattle last week, Montana now has three of the top seven times in the Big Sky in the half mile. Reagan Colyer, ranked second in the Big Sky in the mile, won the 3,000 meters in her first collegiate attempt at the race, running a 9:55.66. She moves into the top five in the Big Sky in that event, which is topped by Emily Pittis‘s time of 9:44.88 from the Washington Invitational. Hodgson, the 2016 Big Sky indoor champion, won the shot put at a season-best 46-5.5 to move within a foot of league leader Katelyn Weber of North Dakota. Feilzer, who entered the season with a PR of 57-11.75, broke 60 feet for the third time this winter, winning at 60-3, three inches off her school record. Montana’s other win came in the 4×400 relay. Olivia Ellis, Franz, Cheroske and Smiedala clocked a 3:56.48. Ellis had runner-up finishes in both the 60-meter hurdles, in a career-best time of 9.06, and the 400 meters with a time of 58.03. Arielle Walden went a career-best 38-7.5 to finish second in the triple jump, her second consecutive week over 38 feet. Carla Nicosia was fourth at a season-best 36-11.5. Alanna Van placed third in the 60 meters (7.86), Hannah Coburn third in the hurdles (season-best 9.12), Maddie Nagle third in the 3,000 meters (10:22.79), and Carrie Jacka fifth in the pole vault at a season-best 11-8.5. The men’s team had two wins, with Sterling Reneau involved in both. He won the 400 meters in a time of 48.58 to move into the top four in the Big Sky, and he teamed up with Callum Macnab, Jordon Wallin and Dylan Reynolds to win the 4×400 relay in a time of 3:18.65 that takes over the top spot on the league performance list. Macnab finished third in the 400 meters in a time of 49.62 and fourth in the hurdles at 8.35, and Wallin moved into the top 10 in the Big Sky with a third-place time of 1:53.63 in the 800 meters. Alex Mustard placed second in the 200 meters (22.23), third in the 60 meters (7.03), matching season bests in both. Karsten Pease was fourth in a time of 4:22.77 in his first collegiate mile race, and Dillon May finished second in the 5,000 meters in 16:08.65. In the field events, Grant Whitcutt was second in the high jump at a season-best 6-6.75, Nick Jackson finished second in the shot put at 53-11.25, and Brett Dringman placed third in the pole vault at 15-3, his third straight meet going 14-7 or better. “I like the progress we’re making and how the athletes are coming together as a team,” said Schweyen. “They are more involved with each other and cheer for one another. Montana will compete next Friday and Saturday at the Mountain States Games at Pocatello.